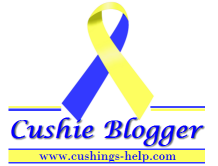 Today is the LAST DAY of the Cushing's Awareness Blog Challenge! We made it! What was your favorite post this month? The post I was most proud of was Dating with a Chronic Illness. I also liked the 10 Things posts here and here. What have you learned about Cushing's? Please share! I enjoyed this month as much, maybe more than I did last year. I'm glad to have all of you along for the ride!